Twitter has sound. Now you’ll be hearing popular music DJ David Guetta tracks in your feed and Glenn Beck rants, because the messaging platform enabled audio clips. The microblogging powerhouse announced the Twitter Audio card system this week, which adds soundbites to the multimedia already being shared through cards—news, video and photos. 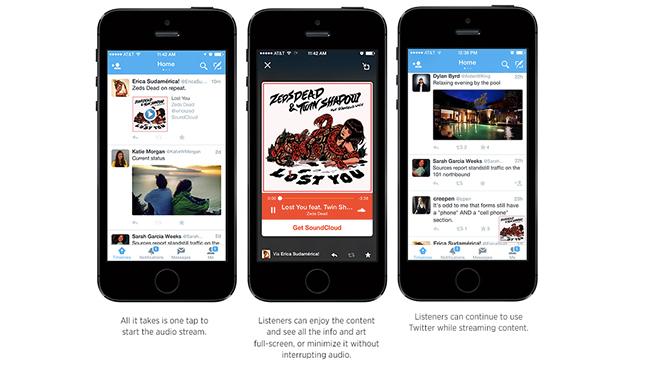 Twitter has a partnership with Soundcloud, the audio sharing site. On Thursday, Chance the Rapper introduced a new song and Guetta tweeted a new remix exclusively on Twitter to show off the new capabilities. Not to pass up another advertising channel, iTunes artists can use Twitter to let fans pre-purchase tracks.